Earlier this year I had the privilege of visiting Disney World in Orlando with my family – or maybe the word ‘privilege’ depends on how much I like to stand in long lines. Either way, we booked our hotel and plane tickets two months in advance. For other trips, we’d probably be done until departure, but not Disney. Shortly after booking I began to get a barrage of emails from them about all the services I could take advance of, ahead of time, by using their online portal. I simply needed to create an account. The slick Disney website offers information on everything from hotels to dining to rides. Though many people just ‘show up’ to Disney World, there are advantages to those who do their research ahead of time and get things pre-booked. Some character dinners even require reservations 365 days in advance of your trip. I opted to create an account for our family to manage our schedules. To do this I needed to input the names and ages of everyone in my party. And so began my mass transfer of personal data to Disney. In fairness, it was a well propositioned trade – they get to know a lot about us and we get the advantage of booking an easier trip. Information acquired: Names, Ages, Genders. Travel dates, hotel reservations. Home address. The original FastPass was a system whereby visitors to the Disney parks could grab paper tickets for a ride that would allow them to return later in the day with a short line-up. Though this worked for some crowd control, there was no tracking on who had what ticket. Recently they upped their game with FastPass+. 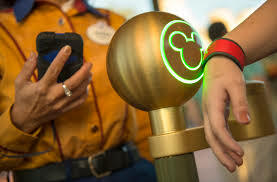 In the new system, visitors could book their FastPass tickets online up to 60 days in advance. You could pick the time for each pass and were guaranteed significantly smaller line-ups. We were limited to 3 rides per park so I combed the blogs, found the rides that needed fastpass tickets and booked them all. We have become accustomed to key cards to enter hotel rooms and wristbands for theme parks or resorts. I was not surprised to see Disney had introduced a bracelet that did both. The Magic Band was touted as greatest thing since sliced bread, and it kind of was. 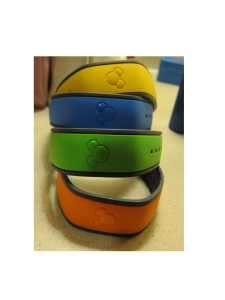 Each bracelet allowed the user to open hotel doors, get into theme parks, use FastPasses and even make purchases. It was the only thing you needed to carry. Through the website they even allowed us to customize colours and names per person, which my kids were over the moon for. 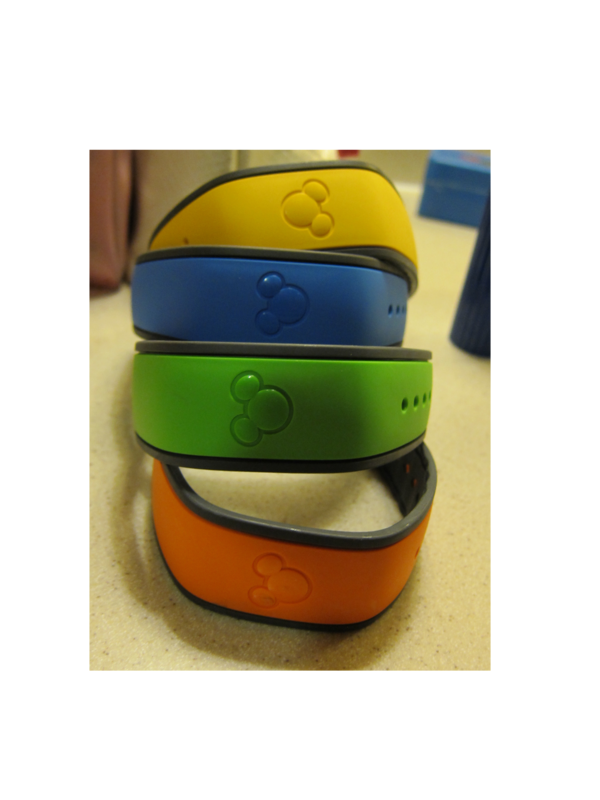 The Magic Band uses RF technologies, which communicate where the band is located in the resort and detect when the band is held very close to a payment terminal, a room lock or a park access point. The only information that needs to be stored on the band is an identifier. The rest of the information is stored in the company’s databases. Here’s where it got interesting. Upon check in we were each given our Magic Bands to wear. I instantly began to appreciate it. No fumbling for room keys, tickets or even your wallet. It is convenience at its best. That’s probably why I let my guard down and stopped considering the amount of data it was gathering… that is until I went for lunch at the Be Our Guest restaurant. Inside Magic Kingdom, Be Our Guest is a large cafeteria-like restaurant in the style of the Beast’s castle from Beauty and the Beast. It holds 500+ people. When you enter the restaurant you are handed a menu and put in a line to order and purchase your food. Once you have made your selection and paid, you are invited to sit *anywhere* in this huge area. Minutes after you have selected a table, your food magically shows up. “Magically”… At least that’s what Disney says. it suddenly hit me that they knew exactly where we were based on our bands. I had a flashback scene in my head of every other thing it also knows…. which rides we went on, what food stands we stopped at, and even how often we went to bathroom. Information acquired: parks visited, path through the parks, rides visited, and length of line-ups. Food purchased, shows attended, gift shop visits, breaks, meal times and bathroom stops. Time in and out of hotel rooms. Imagine the number of inferences Disney can now make based on this data! What rides do people do after lunch vs end of day? What age and gender of kids like thrill rides and princesses? Where are people spending too long in bathroom lines? The quantity of conclusions to be drawn is far greater than the raw data – hence the Big Data. Ultimately Disney’s goal is to optimize the park so patrons stay happier and thus likely to spend more money. So the end result is a win on both sides. Hats off to the engineers and data analytics experts at Disney for a rather impressive example of how Big Data can be used. And if you are trying to stay off the grid, Disney may not be the place for you.